DIET: MAGNESIUM appears to do more to maintain brain health, prevent cognitive impairment (CI), and fight Alzheimer's Disease (AD), than previously thought. Learn how. The results of one medically significant study spearheaded by Dr. Guosong Liu, one of the world's leading cognitive health researchers, suggest that elevation of brain magnesium through dietary intake of magnesium threonate exerts substantial positive effects on brain synapes in a mouse model of AD, actually restoring aging brains to their youthful conditions. The study is the first to show a mechanism for reversing cognitive decline in advanced stage AD mice, and is also the first to show an effective long-term treatment in AD mice. * More exciting, though, are the implications of this study for the potential for treating AD in humans. Commenting on his work, Dr. Liu said, "The body of our peer-reviewed and published work underscores that magnesium threonate can help maintain healthy brain activity. There is no doubt that magnesium threonate has dramatic effects in preventing synapse loss and reversing memory decline in mice with Alzheimer's disease. Furthermore, he states, "There is no question that cognitive impairment is a major fear and health issue for the nation. People are living longer and they want to take steps to maintain the quality of their physical and mental health. Cognitive impairment can affect a person's memory, language, perception, ability to plan and carry out tasks, and judgment. A recently concluded double blind, placebo-controlled human study, the 'gold standard' of science, demonstrates that dietary supplementation of ... magnesium threonate, can significantly enhance human cognitive functions and decrease symptoms of cognitive impairments." The study is expected to be published in a leading peer-reviewed journal in 2014. Dr. Peter Osborne, a Board Certified doctor of clinical nutrition, said, "Healthy cognitive function begins with a solid nutritional foundation. We know magnesium is essential to maintaining healthy brain functions. We know 50 million Americans are magnesium deficit because people do not eat enough foods that contain magnesium. We know that as we age our bodies naturally lose magnesium. For example, drinking coffee or caffeinated products increases the loss. This deficit must be replaced by taking a nutritional supplement." How Much Magnesium is Healthy? Magnesium is widely distributed in plant and animal foods and in beverages. Green leafy vegetables, such as spinach, legumes, nuts, seeds, and whole grains, are good sources [1,3]. 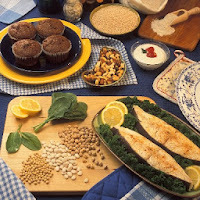 In general, foods containing dietary fiber provide magnesium. Magnesium is also added to some breakfast cereals and other fortified foods. Some types of food processing, such as refining grains in ways that remove the nutrient-rich germ and bran, lower magnesium content substantially . Selected food sources of magnesium are listed in Table 2. Tap, mineral, and bottled waters can also be sources of magnesium, but the amount of magnesium in water varies by source and brand (ranging from 1 mg/L to more than 120 mg/L) . Approximately 30% to 40% of the dietary magnesium consumed is typically absorbed by the body [2,9]. The U.S. Department of Agriculture's (USDA's) Nutrient Database Web site  lists the nutrient content of many foods and provides a comprehensive list of foods containing magnesium. See magnesium & other brain-healthy supplements on Amazon.com. Thanks for this. Nutrition is a huge part of maintaining quality of life as we age, and it's something that is often neglected.